was it worth the 55 year wait? And this is just the first impression of handling one for the first time, and without having yet taken it out of the packet and run a critical eye over it, or even compared it to other offerings. The original PECO (tm) plastic based Streamline track was introduced in March 1960, and the first points a year later. This was always branded as 'OO/HO' as PECO, understandably, had an eye on the international market, and you did not need to be a schoolboy geographer to realise that the Western European and North American markets were always going to be much bigger that the British one. Perhaps disappointingly PECO, who are also publishers of the market leading 'Railway Modeller' magazine, have gone into print over the years to promote the use of an HO trackage system for British OO layouts. One of the claims was that the smaller sleepers and the reduced gap between them somehow compensated for the narrow 16.5mm track gauge (compared to the very right P4 18.83 or the not bad USA OO at 19mm) in a British context. You would have had to be a shareholder to have believed this nonesense, because it has always looked like what it was: underscale European HO track on a British layout. Back in the late 20 Century all was not lost. Marcway of Sheffield was producing handmade points with OO sleeper spacings - and still are! These could be used with Graham Farish or GEM plastic based flexi-rack which featured British sleeper spacing but Code 100 rail. In this respect, the original Hornby Dublo was an early form of Set-track. However, all three system suffered from heavy rail section of flat-bottom pattern, and lacked chair detail. The focus was on a functional rail clip rather than a scale representation. Of these, the GEM was probably the neatest. But the first to offer scale track was SMP. I remember the excitement in the Club Room back in 1971 or thereabouts when the first six inch 'test' sample was removed from its packaging. Interestingly Marcway took over SMP in early 2008 and are now producing the range still with its SMP identity and mainly unchanged. This was followed by C&L (known for a time as K&L). C&L benefited from being second into the market in that they could improve the look of the mouldings, and their chairs looked very nice. Both SMP and C&L adopted a 'thin' sleeper base, or at least, much thinner than the equivalent PECO Streamline offering. PECO finally recognised this growing interested in finer scale track, and introduced a Code 75 rail section in parallel with its Code 100 range. Despite the finer looks and ease of creating curves in the Code 75 range, a surprising number of modellers still prefer the Code 100 track, primarily for its robustness. Notes on how to join Code 70 and Code 100 rail are here. And that's where things remained until late 2016 when C&L announced they were upgrading their flexible track offering to match the sleeper depth of the PECO (tm) range. At about the same time DCC Concepts announced their Legacy OO track system, with a range of matching points promised. One suspects that when the news of a potential competitor in a space that PECO had comfortably occupied unchallenged for over 50 years brought about a sudden re-assessment of the market! Still, better late than never. Because it has been a long wait for a well-made off-the-shelf OO point. With the point still in its packet there are a number of immediate observations. Firstly, it uses PECO's tried and tested geometry, and features a continuous curve through the point - none of that real railway A4 or B7 nonsense here, where the frog is laid at an angle! In fairness, this is probably the right answer as people like me are going to want to lift their HO points and replace them with the new OO ones, and the thought of having to relay sections of the layout does not appeal. However, for those interested in these things, the large radius point frog is approximately 1:6, as seen when laid onto the C&L template. Note how the sleepers are slightly more widely spaced than those of the C&L template. Mechanically the point is similar to the HO offering, but now features a continuous blade and closure rail that runs through to the wing rail and frog. This means the visually weak hinge with its awkward kink is now eliminated, and this is a very real improvement, adding much to the visual appearance of the point. Ironically, modern practice seems to now favour a hinge, so PECO were ahead of the game with the HO range. Interestingly the tie bar that was first seen in the US Code 83 range now makes an appearance for the first time in the UK. The bar is much neater, but no-longer has the spigot at the each end of the bar. Traditionally the PECO point motor base clips over this, and it is also used by the 'slimline' point motor, which nestles alongside the point at right angles. I am informed by the Technical Bureau (is this still part of PECO, as it seems to have a different trading name) that an 10 BA bolt and nuts needs to be fed through the hole to create a new spigot for these items. PECO are arguing that this now allows under-baseboard motors to engage in three places. I'm not convinced, as you'd have to have very constricted underside not to be able to use the traditional centre hole. So whilst neat, I'd have preferred the original for the greater flexibility it offered for above-baseboard motors. One very important aspect of the PECO point - and what actually gives it the edge over the Marcway design - is the self-latching tie-bar. At its simplest, it means the point can be used straight out of the packet without the need for a point lever or switch to hold the blades in place, and the point is easily switched by hand. But it also means that the point can be worked by a conventional solenoid motor: a solenoid will throw a Marcway-type point, but the 'spring' in the blades means the point does not stay switched. Many people have had great success with the Tortoise and its derivative, but again this did not work for me as the steel wire supplied was often unable to overcome the 'spring' in the blades. My final solution for the Marcway-type (and other copper-paxolin points) was to adopt a manual under-board system using piano wire. This relies on friction within the rodding to successfully hold the blades in place. In the storage yard I use DPDT switches to both hold the blades and, originally, to power the frogs. Over the years this has been a major issue using copper-paxolin points, and for a brief time the Minx point control system looked very promising, as it had a neat self-locking actuator. PECO have decided to call time on both insulfrong and electrofrog type points, and is offering a modern version of the 'universal' point. Following any of the Facebook groups show that the topic of how to wire a live frog point - with accompanying track layouts - continues to create many thousands of column inches. Those modellers with long enough memories may recall poor old Hornby Dublo struggling with their first 2-rail point, and having to re-design the points at an early stage. To overcome this problem the people at Beer have hit on the idea of 'Unifrog' which now means that the point can be laid either with the frog dead (so no electricity fed to it) or live. I was initially disappointed when I heard this was the plan, as I thought it would visually weaken the point. But in fairness, with the V of the frog formed with real rails, and not a casting, it looks OK. The metal check rails are also a very welcome feature. If you DO NOT intend to electrify the frog, I would still strongly recommend that a hole is drilled in the baseboard under the frog, and the frog wire fed through it, and just left. Long experience has shown that it is far easier to make passive provision when laying track than it is to try and retrofit something, particularly if glued ballast is involved! Most modern locos, particularly the bogie diesels with their flywheels, are very tolerant of both poorly laid track and erratic power supplies, so work well over dead frogs. However, introduce a 0-4-0 type and it is a very different proposition, such as the Hornby/Dapol Pug or the Bachmann Greg/Percy. An aspect of the point that will appear strange to modellers used to the existing PECO range, or indeed points built using C&L templates and SMP kits is that it appears to be a type latterly associated with the Great Western! What? Why? How? Looking at the point still in its green packaging slip, the sleepers orientation and spacing stand out as being different to both standard HO and current OO finescale offerings. The immediate thought is that it is a 'Y' point. 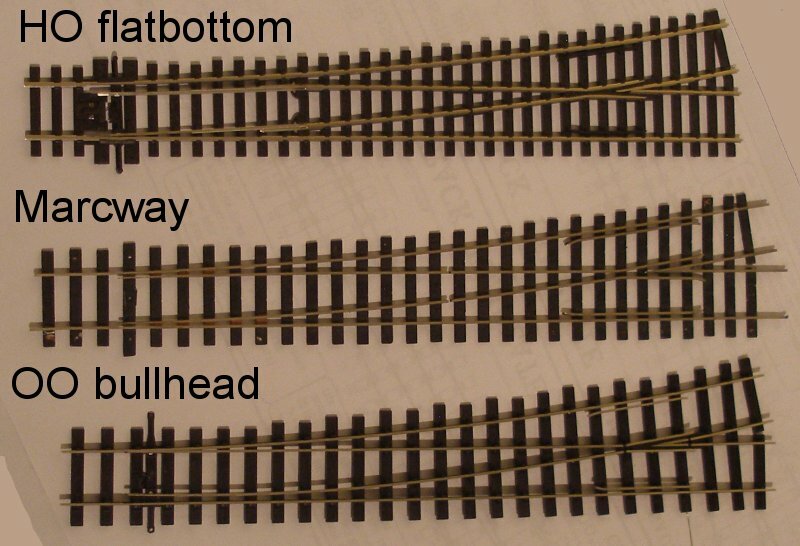 Most modellers - and off-the-shelf models - favour pointwork with the sleepers that are at right-angles or 'square on' to the straight stock and closure rails. This form of timbering dates came into more general use from the 1920s, and became increasing popular over time. However the GWR, for one, decided that the sleepers in and around the frog (crossing) would favour neither stock rail, and would be 'equalized'. It is worth noting that diamond-crossings and slips are always equalized, at least within the middle section, as it is practically impossible to get all the K-crossing rail-fixings in the correct place if the timbers are square-on to one of the roads. The 'Railway Modeller' November 2017 issue review noted that the new point uses equalised timbering, which the review suggests was standard practice on the GWR. It suggested that the 'square on' timbering configuration dates from the introduction of mechanical track maintenance machines (tampers). This can be dated to 1947 when the LNER was loaned a B27 Matisa tamper - the rest is history, as they rapidly becoming one of the most popular track maintenance vehicles in the BR fleet. Bob Essery in issue number 23/1988 of the 'Model Railway Journal' on page 154 provides a scale plan of a Midland turnout. 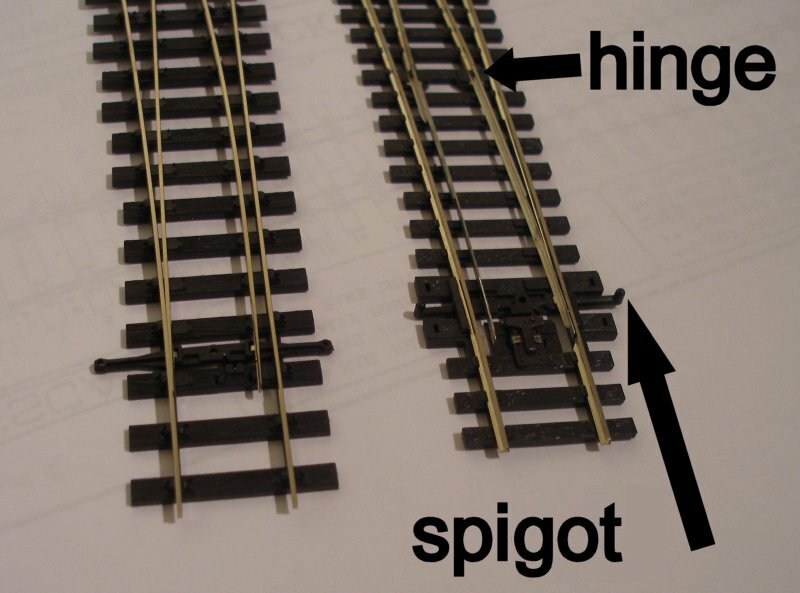 This has sleepers at right angles to the straight stock and closure rail, but also shows the sleepers at closer spacings (to give greater support) at the frog. Checking the C&L templates for A4, B6 - B8 points also show the sleepers laid 'square on'. The SMP templates illustrated on the Marcway Website are also for this configuration. I am grateful to David Woodcock on the Yahoo! GW-LIST who has the following explanation: "It was standard, i.e. 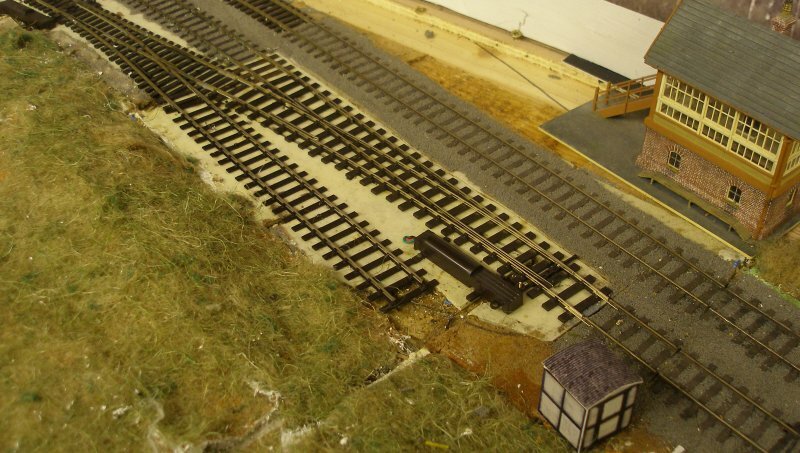 not just Great Western, practice to lay out the timbering for bullhead p & c so that it was orthogonal to the centre-line through the crossing - exactly as the new PECO track has it. There was a very good reason for this - it minimised the angle at which chairs lay relative to the timber to which they were fixed, something that became very important as chairs moved up from having just a single fixing either side of the rail (which was necessitated by the heavier axle loads of passing trains). It was the desire to minimise this angle that lead some railway companies to use interlaced timbering within p & c work - although that lead to its own complications because of the difficulty of packing the ballast well. The problem could have been minimised by using even wider timbers, 14” instead of 12”, but these were disproportionately expensive and only used where absolutely essential." There were exceptions, even on the GWR. A correspondent has noted that Reading Main Line West Box had parallel, square-on timbering on adjacent tracks to allow the point rodding to pass under the tracks, and this would have been a feature at other major junctions. Michael Woolford on the Templot group notes: "Generally speaking, equalized timbering was the norm in the pre-grouping period (before the 1920s), and square-on timbering is the standard now. Between then and now you get both. The change was gradual and varied in pace according to local practice. For much of the post-grouping steam era it would be common to see square-on used for main running lines, with older equalized timbered turnouts predominating in yards, sidings and branch lines. (Except on the GWR, where there is evidence of the exact opposite! Early turnout drawings show a square-on style, but when the flexible switches were introduced in 1930, the drawings show equalized. In many cases it seems simply that the preference of the local relaying inspector was the deciding factor.)" In fact, the Railway Clearing House set-up a committee to consider the 'Standardisation of Railway Equipment - Permanent Way Track and Signalling' on 1 July 1919; members were drawn from LBSC, NER, Midland, GNR, Caledonian, SE&CR, L&NWR and GWR, and chaired by the GWR. They subsequently provided plans for a British Standard bullhead point and an Upper Quadrant signal, which the LMS, LNE and Southern all endorsed and implemented. To give this context, the GWR in 1924 had a route mileage of some 3,797 miles, compared to the LMS with 7,790 miles; the LNER with 6,590 miles and the Southern with 2,186 miles, so the GWR accounted for 19% of the network in the 1920s. Ernest Bate's remarkable Web resource at oldpway.info provides an archive of original pre- and post-grouping drawings, some of which appear to have been taken from "British Railways Points and Crossings" by W B Worthington. The PECO point can be checked against the GW drawing of a crossing here. Working through this remarkable archive, the pre-grouping railways that there are drawings for showing crossing construction confirm that the following railways used this form of construction: Furness; Great Northern, Lancashire & Yorkshire; London & North Western Railway; London & South Western and London Brighton & South Coast. The Great Northern of Ireland appears to have a unique variation on this theme! Finally, those that used 'square on' timbering include the Hull & Barnsley; Great Central Railway (MSLR) and Midland (as per Bob Essery). It should be noted that whilst these companies had a similar style, there were considerable differences in spacing and frequency of sleepers. It also has to be said that the timbers laid in the orthogonal pattern also varies: some companies (as per PECO) have all the sleepers so laid; whilst others have the toe laid conventionally, and only the crossing/frog laid orthogonally. This therefore suggests that the PECO point is a common pre-grouping type, and does indeed follow GWR practice. The Committee on Standardisation of Permanent Way in 1920 led to what is known as 'Standard Practice'. Post-grouping, the standards proposed were adopted by three of the four post-Grouping companies, the exception being the GWR. The Committee, however, continued to endorse the retention of bullhead rail, although Andrew Dow in 'The Railway: British Track since 1804' suggests that Swinnerton's April 1939 paper to the Permanent Way Institute showed that the arguments for the retention of bullhead no-longer applied, and the rate of adoption of flat-bottom started to increase thereafter. Indeed, the first flat bottomed turnout laid on a British mainline was recorded in the Railway Gazette of 20 October 1944, having been laid in on the East Coast Mainline at Harringay in January of that year, and the diagram accompanying the article does show the sleepers laid orthogonally through the crossing area, although a photograph in Dow's book shows that it was, in fact, a Y. The LMS also laid its first flat-bottomed point in 1944, in this case at Kegworth (LMS Journal 13). The LMS drew on US experience, and laid a number of test sections of flat bottom c.1937 on the Midland Main Line in the London and Derby South Districts, and a further section north of Carlisle. A further 12 trial lengths were laid in 1939 totaling 11.25 miles. British Railways formally adopted 109 pounds flat-bottom track with cast-iron baseplates and elastic spikes in 1948. The difference between equalized timbering (PECO) and square-on timbering (C&L) can be clearly seen when the point is laid on a C&L template. 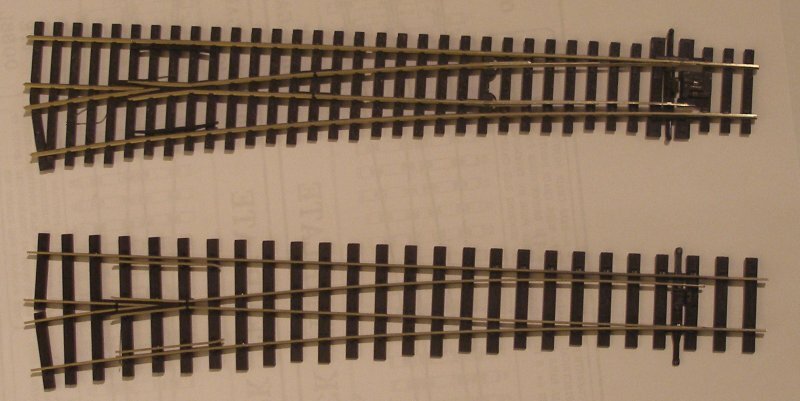 This is the template for a B7, so a size or two larger than the PECO point, but the orientation of the PECO sleepers versus the template can be clearly seen. The direct comparison with the HO large radius Code 75 point shows the dramatic difference with the new range. The smooth flow of the point blade on the new point is in sharp contrast to the hinged joint with its obvious kink. The OO point, as might be expected, switches beautifully, with its self-locking tie-bar. The switching is so smooth and precise one might wonder why this hasn't been adopted on the original range, but it could be that the bullhead rail flexes more easily than the original flat-bottom type used in the two European ranges. The underside shows how the pre-wired sections have been altered. The arrow indicates the wire from the frog. For those wishing to simplify things by having insulfrogs (dead frogs) can ignore this wire (it can be cut off), but for anyone needing an electrfrog (live frog) this needs to be wired to a double pole switch, such as the PECO PL-13 which attaches to the classic solenoid, or DCC users can use something more elaborate such as the Tam Valley Depot Frog Juicer. The other aspect of these points which PECO haven't flagged up is that they appear to be 'DCC Ready'. In the previous scheme of things, the electrofrog points needed to be modified for reliable DCC usage. This involved breaking off or cutting the wires connecting the blades to the frog, and then soldering wires to connect each stock rail to the adjacent blade. The need for this arose due to loco wheels shorting when the backs of the drivers caught the blade which had the opposite polarity to the stock rail. It is apparent from the various Facebook groups that the breaking of these wires is quite a challenge the first time it is attempted, so this is a very worthwhile development. A further modification was to wire round the hinge to provide robust electrical conductivity for the point blade. However, at a stroke, the new design eliminates the need for these modifications and the new point was laid 'as supplied'. Comparing the new PECO point with a standard hand-made Marcway illustrates how close the PECO example now is to the long-established copper-paxolin (soldered) point. On the plus side, the PECO point has some very accurate chairs, including some nicely rendered 'slider' chairs under the blades. The plus for Macway is the more conventional sleeper spacing, including the closer spacing under the frog. Having assessed the point, the time has come to lay it on the layout. Hall Royd has some of the PECO side-mounted motors, and therefore a 10 BA nut and bolt had to be fitted to the tie-bar. The location has a pair of HO points forming a crossover. As the other point is a short-radius that will have to wait for another day. Both have the side-mounted motor. Here is the original HO long radius Code 75 flat-bottomed point. ...but there is a small but highly significant detail. The 10 BA bolt that was screwed through the tie-bar needs trimming. Otherwise this is the result! This photo also well illustrates the greater depth of the PECO sleepering, compared to the original C&L, a sample of which has crept into the very bottom left hand corner of the photo. In operational terms the point represents a raised section of track, which trains seem to negotiate happily enough although visually there is a distinct hump. The solution will be to relay the approach track with PECO bullhead. The point initially seemed stiff, with the motor not fully throwing the blades. But a little bit of fast tie-bar wiggling seem to ease matters and within minutes the point was working perfectly. And a final look at the new point. This shows how relatively chunky the HO short radius point looks in comparison, and how well the PECO sits between tracks laid with C&L and SMP. For those interested in such things, the L&YR signal box is by Peter Leyland and is based on Kirkby. This closely resembles the box that stood at Stansfield Hall Junction, the location that is represented here. However, some might question why a 'calling-on' arm is being used to signal trains into a loop, rather that the classic short siding arm. The answer is that the signal is based on the prototype, and the arm was to allow a banking engine to buffer up to a train waiting to proceed towards Burnley via Copy Pit. However, the junction is actually laid the wrong way round (tracks should trail in from the left) so the caling-on arm is regarded as one of those local variations that make signalling as a subject in its own right so much fun. The Bullhead point - with its typically deeper PECO base - is easier to ballast, due to the greater depth of the base, whereas a thin layer of stones as used for the original C&L and SMP track is easily disturbed. The photo shows the point pre-painted using Humbrol #86, and the initial laying of ballast, in this case Woodland Scenics Fine Gray Ballast. The initial ballast laying is now complete, and the bottle of IPA - wit all its hazard warnings - is to hand for the next stage. 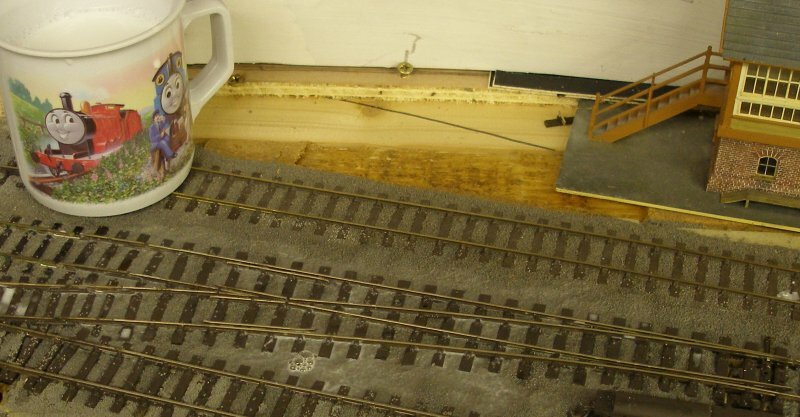 The first time I saw the suggestion use of IPA to moisten the ballast before applying the PVA was an article by the Merseyside Model Railway Society when they were laying ash ballast on their Cambrian O scale layout. This technique prevents blobs of the PVA solution forming on dry ballast. This was a regular occurrence for me despite adding a drop of washing-up liquid to the diluted PVA. This is the result after applying the IPA with a dropper. Finally, the diluted PVA is mixed up in a Thomas mug, a drop of washing-up liquid added, and the mixture applied to the ballast with a dropper. The mix in this case is approximately 8 drops of water to one of PVA. The equalized timbering was a surprise, and it would be interesting to know what market research PECO conducted. Certainly it was a common configuration before 1920 on many pre-grouping railways, and on the GWR until Nationalisation. For those modellers who have adopted the later square-on timbering using either home-made or off-the-shelf, it is going to be a disappointment, particularly after the long wait. Like Brexit, half of us are going to be disappointed. Ironically this now leaves a gap for the proposed Cobalt Legacy range to exploit. This, by the way, promises inwardly tilted rails which is another prototype permanent way feature not reproduced in other track ranges. 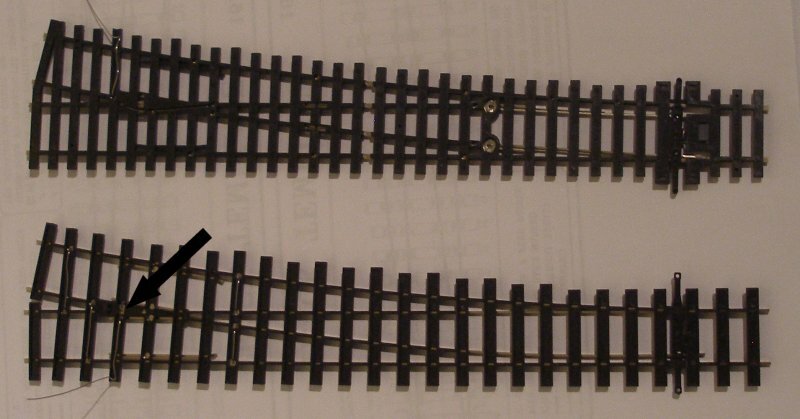 The sleeper spacing may also be awkward for users of other brands of Bullhead flexi track, and, as the photo above shows, it does not sit well with the C&L track laid alongside (top and bottom). It may be possible to re-sleeper the points, but at that stage you should be building you own anyway :-). In all other respects it is a winner, and the thing that marks it out from competing hand-made systems is the self-latching tie-bar. 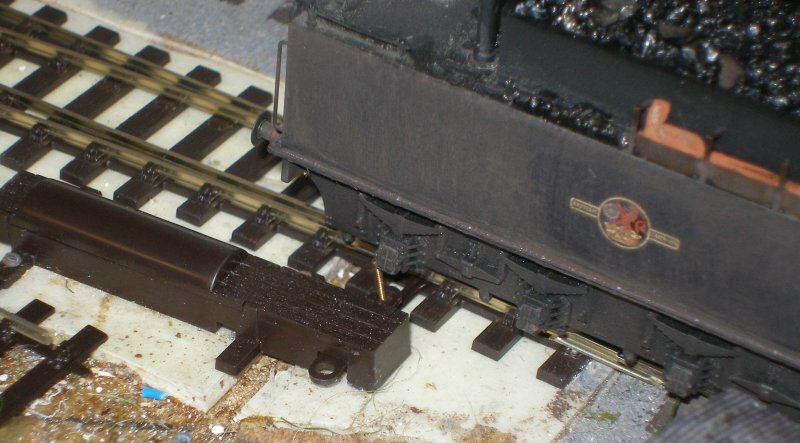 The Uni-frog will be a major benefit for those modellers who don't need the complication of live frogs but like the appearance of all metal rail construction. It is well engineered and DOES fill a major gap in British OO trackwork. It is pricy - almost twice as much as its HO equivalent - but the British OO market is relatively small, and a customised item has to 'wash it's face'. Dedicated finescale modellers are always going to be a sub-set of British modellers, so PECO have probably - accurately - calculated that demand will be restrained, and need to ensure they recoup their considerable investment. And we need them to extend the range. I for one will be looking forward to further additions, and they will probably be my 'standard' in the scenic areas going forward. Nice one PECO! Just don't make us wait so long for the next one :-).